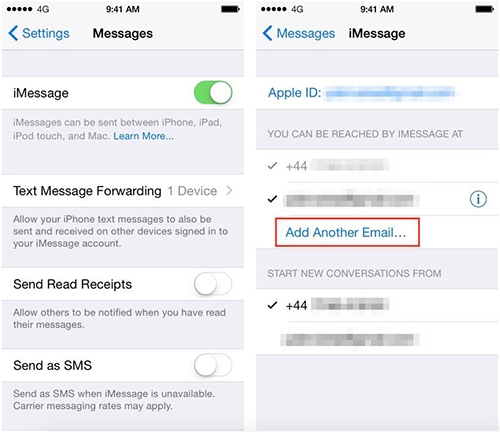 How to add multiple email addresses to iMessage? This guide tells you how to make it quickly. Download AnyTrans to have a try to freely transfer iMessages from iPhone to to iPad or computer after reading this guide on how to add multiple email addresses to iMessage. Apple iMessage service is a good way to send & receive text messages as well as attachments like photos, videos, etc. It works with Apple device like iPad , iPhone, iPod touch running iOS 5 or higher, and Mac running OS X Mountain Lion or higher. iMessage is very popular among Apple users, one of the reasons is that you can send and receive free messages as long as the network is available. You can send and receive iMessages with your phone number or Apple ID email address. If you have multiple email addresses and want to use all of these emails to work with iMessages, how can you make it? Now Read this guide to know the steps. Step 1. Go to the Settings app on your iPhone or iPad. Step 2. Scroll down and tap on Messages. Step 3. Now tap on Send & Receive. Step 4. Select Add Another Email, and type in the email want to add. Step 5. Go to your email, and confirm that you have access to the newly added email account. If you accidentally delete some important iMessages without any backup, you can let PhoneRescue to get back the iMessages. It is a professional iPhone data recovery which helps you recover deleted text messages and iMessages. You can use AnyTrans to directly clone iMessages from one iPhone to another, or youc an transfer them to computer as backup. Any questions on this guide is warmly welcomed, and don't forget to share this post with your friends if it is helpful for you.